It may be wise to consider buying a compact Sports Utility Vehicle (SUV) instead of a C segment sedan, as the SUV segment continues to grow fast in India. For a similar price, one would be able to buy the Ford EcoSport soon, which was revealed across malls in Delhi and Mumbai. The car was first seen at Infinity Mall, Malad in Mumbai and then at Select City Walk, Saket in Delhi on 17th March. Prior to the official launch of this compact SUV, a soft launch is expected to take place across ten cities of the country. Reportedly, three different engines would be provided with the upcoming EcoSport, namely 1.0 litre EcoBoost petrol, 1.5 litre TiVCT petrol and a 1.5 litre diesel. Every vehicle is expected to get a 5-speed manual transmission, while the TiVCT engine would be mated to an automatic 6-speed dual clutch gearbox, in addition to the manual version. Interestingly, technology such as Ford Sync has been provided within the model, which will help individuals in connecting the infotainment system of the model with smart phones. Since it was a soft launch, there was no information on the price of the EcoSport. Along with, a new promotional campaign called the EcoSport Urban Discoveries would allow participants to drive this vehicle for 21 days prior to its official launch. Last date to register for this campaign is 31st March 2013 and around 35 lucky winners will be chosen among the registrations. Tremendous hype has been created in the media for this car. 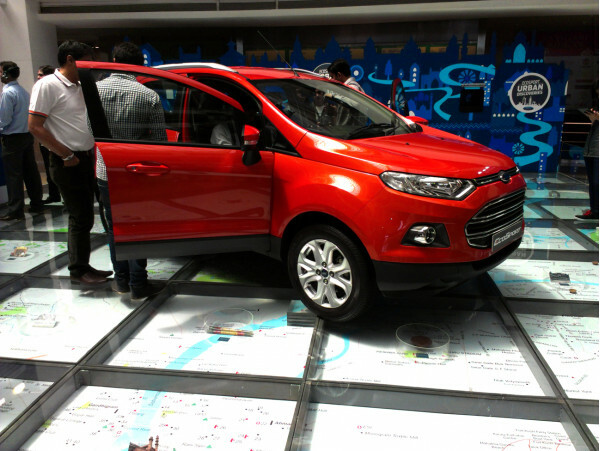 There is a lot of eagerness among buyers for the Ford EcoSport and this was seen in the way photographs of the car were being clicked in the malls. Originally the EcoSport was first seen at the 2012 Delhi Auto Expo and was able to create a buzz among the Indian audience. Some specifications of the vehicle were also revealed during November 2012, such as 200 mm ground clearance, 550 mm water wading ability, 25 degree approach and 25 degree break over angles; however nothing is confirmed as of now. Safety features would include side curtain airbags in addition to driver and passenger airbags, traction control, Anti-Lock Braking System (ABS) and Electronic Braking Distribution (EBD). Post launch, the model will deliver a stiff competition to Renault Duster, which is currently ruling the compact SUV segment of the Indian auto market.